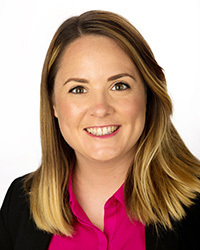 Originally from Cork, Ireland, Dr. Bianca Doherty joined the faculty at the University of St. Augustine for Health Sciences in 2018. She completed her Bachelor of Science degree in Occupational Therapy at University College Cork, following which she worked as an occupational therapist in primary care in Kilkenny, Ireland. Dr. Doherty went on to obtain her Master of Science in Occupational Therapy (Post-Reg) at Queen Margaret University, Edinburgh in Scotland. While completing her master’s, she worked with Scottish Autism, the largest provider of autism-specific services in Scotland where she supported adults with autism at a day center and in their homes and local communities. She recently completed her Doctor of Occupational Therapy degree at the University of Southern California. She completed a clinical residency at the USC University Center of Excellence in Developmental Disabilities (UCEDD) at Children’s Hospital Los Angeles, working with children aged 0-21 with developmental disabilities and co-occurring mental health challenges to improve participation in the activities of everyday life. Dr. Doherty has also completed training in “The Get Permission Approach to Pediatric Mealtime Challenges” by Marsha Dunn Klein, the USC Sensory Integration Hands-On Clinical Training Program (OT610), and the California Leadership Education in Neurodevelopmental and related Disabilities (CA-LEND) program at Children’s Hospital Los Angeles. Her doctoral project focused on the preliminary development of a Self-Advocacy discipline at CA-LEND in collaboration with the national Association of University Centers on Disabilities (AUCD). During her doctoral year, Dr. Doherty also worked in the USC Chan Division of Occupational Science and Occupational Therapy’s Global Initiatives office, providing support and mentorship to the international OT student community at USC. She is a member of the American Occupational Therapy Association, the Occupational Therapy Association of California, the Association of Occupational Therapists of Ireland, and the World Federation of Occupational Therapists.